When ideas emerge from right-wing think-tanks, appealing to popular resentments about existing bureaucratic systems and vaguely promising a brighter future for all, maybe we should be prepared for trouble. 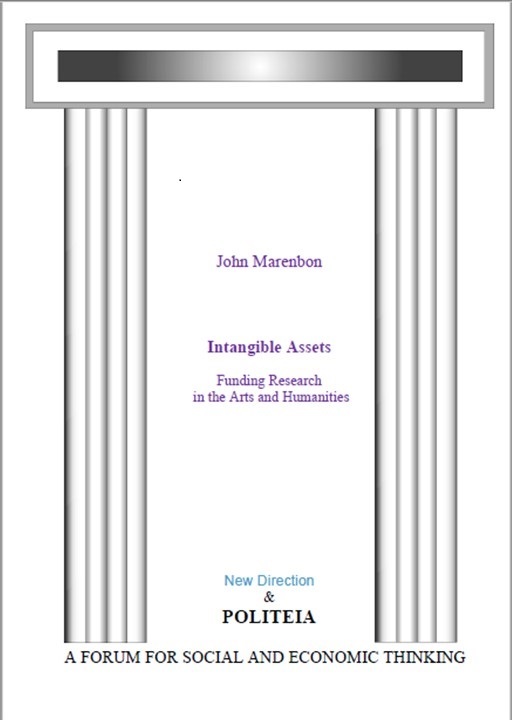 And so it goes with John Marenbon’s Intangible Assets: Funding Research in the Arts and Humanities, which makes a delightfully subtle case for ‘funding’ by removing the arts and humanities from their two principal funding streams. Readers of the report might know Marenbon as a distinguished Cambridge professor of Medieval philosophy. Or they might remember him as the author of such articles, released through the Politeia think-tank, as Militancy on the March (attacking the academic strikes earlier this year), or ‘OFFA’s Topsy-Turvy World’ (a critique of widening participation in higher education). From the perspective of a senior research fellow of Trinity College, it is perhaps easy to believe that humanities researchers should not have to scrabble about for state funding, submitting ourselves to scrutiny and public accountability. One’s college does a much better job of supporting one’s research. Intangible Assets proposes abolishing the Arts and Humanities Research Council (AHRC) and removing arts and humanities subjects from the Research Excellence Framework (REF). (The latter argument was repackaged for The Guardian last week.) He suggests that the quality-related (QR) funding that flows from the REF would remain the same, but be determined by the performance of all those other subjects which are so manifestly more suited to the REF’s assessments. AHRC funding, meanwhile, would be redirected into the creation of permanent teaching-and-research posts. The British Academy, which accounts for a small fraction of arts and humanities funding, could stay, because its standards are sound – and, well, John is a fellow, of course. How we would continue to fund PhD students remains something of a mystery. The report’s evidence is heavy with questionable assumptions and back-of-an-envelope statistics. If I was trying to determine how much time a REF panellist devotes to grading an item, I might start by surveying some of them. I might also consider whether their universities relieve them of other duties while working on the REF. But that would be too rigorous for Marenbon, who concocts his way to a figure of 2000 pages of reading a day, to be done outside normal hours. (Conclusion: The REF is a sham.) Similarly, before dismissing the assessment of impact – which he considers pointless for the humanities – I might bother to read some four-star case-studies. I might also enquire about the effect of QR funding on arts and humanities departments across the sector, before asserting that ‘no [QR] money reaches’ them (an outright falsehood by my experience). And I might even consider the achievements of some AHRC-funded projects before pontificating about the ‘damage’ that grant-funding does. Indeed I might consider these to be basic methodological expectations of a researcher. Some arts and humanities academics – particularly those involved in institutional struggles for resources and recognition – might as a result feel uneasy about Marenbon’s logic. He breezily assumes that if the overall QR pot remains the same, universities will remain well resourced and the arts and humanities will be protected. Hence universities should be required – presumably by the Office for Students, but he doesn’t say – to provide research leave, while somehow or other all that former AHRC money will find its way to the right place. How this all squares with resource allocation models within legally autonomous institutions, a culture of ‘value for money’ in a sector otherwise funded by students’ fees, and a mass higher education system with vastly uneven funding and career structures to begin with, is never really addressed. Like so much utopian discourse, Marenbon relies heavily on an idealized representation of an ‘old world’. There was a time, he says, when arts and humanities academics all did some teaching, some research, and paused every day for a three-course lunch at high-table. Ok, so I made up that last bit, but the vision of a world in which nobody was monitoring academics’ work, nor urging them to compete for research support, and assessment was reserved for the rare occasions on which one would apply for promotion, is designed to seduce. What’s not to like? In truth, this is a blueprint for constraint and elitism. Oxbridge would survive well enough, but what about other universities, where resources are tighter? If no income was generated by research in the arts and humanities, could we confidently expect the vice-chancellor of a university struggling with debt and falling student numbers to maintain staffing levels and protect research time, let alone consider promotions and pay-rises in the humanities faculty? Moreover, it’s worth noting that some universities never experienced the revered ‘old world’, so it’s a bit of a stretch to imagine how, from current working conditions that are often radically different to those familiar to Marenbon, they might now contrive to return to it. And with no research council to make the case for what we do as researchers, could we realistically hope that policy-makers would smile benignly upon us for ever more? Like many who profess to believe in a small state, Marenbon places great trust in its readiness to enforce the regulations that he devises. As much as we might sometimes wish to deny it, money matters for the arts and humanities. Within a year from now, in the wake of the Augar Review, students could be paying less for arts and humanities degrees. Already many universities are under financial strain, and redundancies and departmental closures are likely to accelerate. The system as a whole is fluid and contested, and in this context both the REF and the AHRC give the arts and humanities visibility, credibility and representation. These things matter. Even to contemplate tossing all that away risks inviting all sorts of insidious and unreliable forces into the conversation. After all, there are plenty of people who would like to see the arts and humanities weaker and poorer. To pretend that we can improve working conditions while evading public accountability and competition for resources is thus to display reckless disregard for the prevailing conditions in which we operate. Right now there are people in this country fighting tirelessly to convince sceptical politicians of the value of the arts and humanities, in the many contexts in which they are taught and researched. John Marenbon is not one of them. With the resignation in the final hours of November of Sam Gyimah as Minister for Universities and Science, higher education loses not just another minister, but its most endearing animoji. This fresh-faced two-dimensional cartoon figure took an astonished sector by storm in 2018, tracing the minister’s journeys through higher education, bristling with conservative fervour yet rapidly coming to appreciate the quality of British universities. The departures of both the man and his animoji leave many questions behind. In a Brexit context, Gyimah’s resignation feels significant because of his record of careerism and party loyalty. While Jo Johnson, another former Higher Education Minister, produced at the moment of his resignation as Minister for Transport last month a perfectly formed argument for remaining in the European Union, Gyimah’s farewell facebook post was rather a cry of confusion and anguish. Though remainers will doubtless claim him as one of their own, he is in truth not sure who to blame, nor what the country should do next. This is a man who drank deeply from the Brexiters’ Kool-Aid after backing ‘remain’ in the 2016 referendum, and is only gradually coming back to his senses. His willingness to share his learning processes also made him an intriguing minister. David Willetts, one of Gyimah’s most influential predecessors in the role, famously began his book, A University Education, with the statement: ‘I love universities.’ Gyimah came around to the same position, as he declared to the Universities UK conference in September; however, his love was never unconditional. He inherited the right-wing free-speech crusade from his predecessor, and ploughed ahead on this front with little regard for evidence. He also drove forward Johnson’s agenda of ‘value for money’, founded on ever-more detailed graduate salaries data. And he famously declared himself ‘minister for students’, almost as though suggesting that universities couldn’t be trusted with such responsibility themselves. As a result his public declarations about universities were wildly erratic, and also notably partisan. His interest in student welfare, for instance, was well-meaning and timely, yet his ‘Sam on Campus’ events combined a genuine effort to listen with an attempt to rally Conservative students. And even in his last week he maintained his pattern of provoking in one speech and placating in another: lashing out at supposed ‘poor-value’ courses, acknowledging that ‘earnings are not everything’, celebrating agricultural and space technology, and then promising at the Times Higher Education awards that ‘as long as I am minister I will fight for universities’ interests’. Perhaps he never really wanted academics to trust such promises, since getting too close to the sector had proved fatal for his predecessors. To be fair to his critics, though, he gave plenty of cause for mistrust. Yet maybe the promise of support was also increasingly difficult to fulfil. 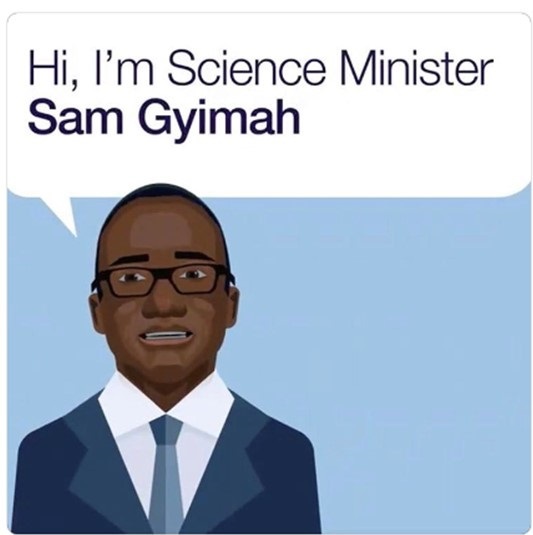 As much as he and his animoji strode purposefully onward, Gyimah’s ministry was surely being torn apart on at least two fronts. Firstly, the discourse of value for money was driving hard towards simplistic solutions damaging to the sector he had come to love. University closures, for instance, are easy enough to embrace in theory, but trickier in practice. Then there is the spectre of the Augar review, with its widely-leaked thinking around fee-reductions (possibly with a promise to make up the difference from government spending – like, honest). Gyimah inherited this along with much else; indeed it is widely believed that the opposition to it of Johnson and then Education Minister Justine Greening played a role in their respective dismissals. It was also stamped from the beginning as Theresa May’s project, that would report jointly to the Secretary of State for Education, Chancellor of the Exchequer and Prime Minister. But his influence could still have been critical when that report hit those desks, and rumours suggest that he was wary of the damage it may cause. Secondly, he was torn on the question of research. Indeed it is hardly surprising that Galileo, the biggest of big science projects, appears to have been the satellite that broke this minister’s will. His arguments that the UK could drive towards ambitious increases in research and innovation funding – aiming at a target of 2.4% of GDP, from a starting position of roughly half of that – were feeling increasingly stretched against the fiscal realities of Brexit. He must have understood that himself, for all his evidently naïve confidence. And he must have felt the strain of that tension, since he embraced the world of science and technology with a passion. Moreover, he appeared to understand the importance of research collaboration. His suggestions that academics would be able to replace the effect of EU funding if we just tried a bit harder were unquestionably ham-fisted, playing to the Brexiter gallery, but there was more to him than that. Importantly, in his final days he was arguing the case for international researcher mobility, pleading for universities to have special status in any new immigration regime and stating that UK access to EU funding after Brexit ‘won’t work’ without mobility. Not every politician gets this point. One post-Gyimah scenario might go along the lines: May loses her vote, resigns, is replaced by someone less antipathetic towards universities, and Augar gets politely buried. After all, nobody apart from the Prime Minister really wanted the review in the first place. But that is surely utopian thinking; instead the sector will have a May loyalist, signed up to the delivery of Brexit, sceptical of a sector in which leading figures have been finding an oppositional voice in recent days, and therefore happy enough to inflict some pain in the interests of career and the shadowy outlines of a plausible ideology. Gyimah’s journey perhaps demonstrates that it is difficult to spend any time in British higher education without coming to appreciate it – even to love it – but his successor could have precious little of that commodity on his or her hands before making pivotal decisions. From a distance, one might well reflect that this is no way to manage a university system. But then it’s no way to run a country either, yet we seem to be doing it. This is the 12-inch version of my 7-incher in the ‘THE’, 15 November 2018. Editors do tend to fret about things like words and – well – accuracy. Here’s to artistic freedom. The past was a simpler time; governments controlled universities then. 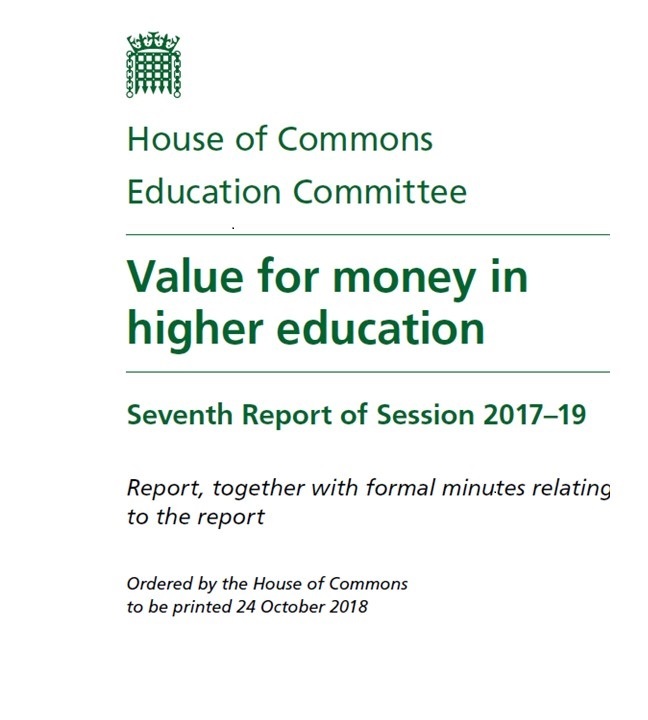 This nostalgic fantasy, at the heart of so much public discourse about higher education, is articulated with admirable energy by the House of Commons Education Committee in its recent report, Value for Money in Higher Education. Its list of recommendations stretches to twenty-eight, packed with things that universities ‘must’ or ‘should’ do, but somewhat slighter on quite how they can be made to do so. It demonstrates at once the shortcomings, but also some benefits, of a quest for simplicity. The quest to define value for money in higher education has taken many commentators down some twisting paths in the past year. It has a tendency to become all-encompassing, unlocking a higher education theory of everything. 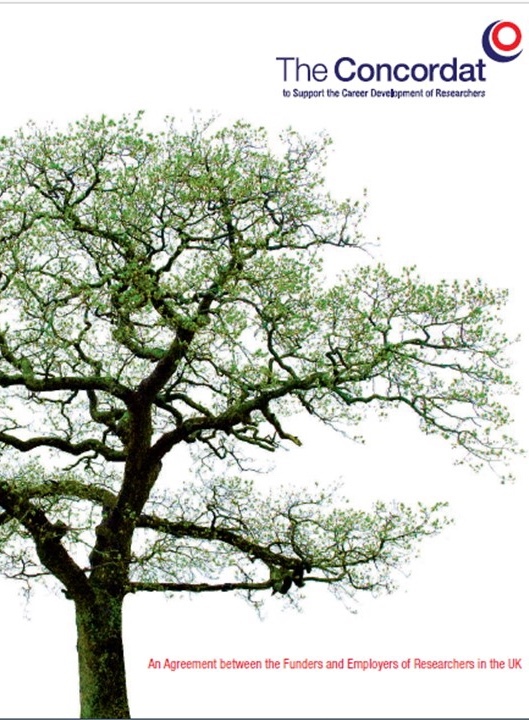 This report is a classic of this genre, setting out to consider value for money from the perspectives of: graduate outcomes and the use of destination data; social justice and support for disadvantaged students; senior management pay; quality and effectiveness of teaching; and the role of the Office for Students. As with any research project, the Committee’s methods, for better or worse, lead to its conclusions. These methods boil down to listening to a bunch of different people. Hence the common structure: ‘we heard X say this, Y say that, Z say the other, and we think A’. Sometimes ‘A’ feels like wishful thinking: such as when they call for the reintroduction of means-tested maintenance grants, without having to worry about where the money comes from. They also acknowledge that prospective students take no notice of the Teaching Excellence Framework, yet conclude that, ‘For the TEF to improve value for money … it must play a more significant role in the decision-making process of applicants.’ Well, quite. Granted, there are some steps in the right direction. The Committee has grasped that the debate over two-year degrees is rather more complex than some may have thought this time last year. The costs are not significantly lower, these degrees offer little opportunity to earn money or gain work experience along the way, and therefore they do not offer a magic solution, especially for lower-income students. But elsewhere the report strains against the weight of evidence. On the TEF, for instance, they heard that it is costly and arguably does not assess quality at all; however, they conclude only that it requires a little ‘embedding’. But the method is not helpful for understanding massive differences between the missions and objectives of different universities. The concept of institutional autonomy is foreign to this report, and the idea the overpaid managers of universities might make independent decisions rather unnerves them. Hence, they note, ‘We are disappointed that institutions such as Oxford University are not offering degree apprenticeships’, and they ‘encourage’ universities that are wary of admitting applicants with BTECs and T-Levels to think again. And managers are overpaid, by the way; the ‘current system of self-regulation for senior management pay,’ the report asserts, hankering again for state control, ‘is unacceptable’. Above all, the Committee’s approach eschews complexity. It is a peculiarly myopic exercise to consider universities purely as providers of undergraduate education to home students, and as a result to focus entirely on what happens to those students’ fees. This report says nothing about postgraduate students, barely mentions research, and fails to acknowledge the international context within which universities operate. It nods once towards Louise Richardson, Vice-Chancellor of the University of Oxford, on ‘the international outlook of many of our most prestigious universities’, but moves swiftly on. (One is left with the impression the MPs didn’t much warm to Richardson.) But international students? International collaborations? International league tables? Not a word to be said. Like much post-2012 commentary on universities, this report positions fees as individual debt in one paragraph, and ‘public money’ in the next. This is in part a matter of tactics; it suits the argument at different times for the money to be either that of the individual or the taxpayer. Yet the impression it gives is of someone turning a naïve gaze upon a complex machine, and looking for simple answers. To give it some credit, sometimes it finds them. For example, it’s excellent on university admissions. It comes down against unconditional offers, but firmly in favour of contextual offers. On the latter point, some vice-chancellors might mutter darkly about the failure of successive governments to stand up to the Daily Mail on this point, but it is nonetheless welcome support for a good cause. And the Committee trashes the use of entry-tariff as a measure in league tables. That argument is somewhat more complicated, since applicants may reasonably want to know about the quality of those they with whom they will learn; however, it’s still useful to know that objective observers, like many academics, see this metric as a worthless indication of a course’s quality. Their perspective is also bracing on flexible learning, even if these points will be obvious to most people within the sector. Policy in recent years has focused unhelpfully on 18-21 year-olds, even as the mature-age and part-time markets have collapsed. Their recommendations, that universities ‘should move away from a linear approach to degrees’, and that the current post-18 review might ‘develop a funding model which allows a range of flexible options’, are not exactly plotting a clear and easy path towards recovery. But it’s not as though anyone else has cracked this puzzle either. Much has changed over the fourteen months through which the Commons Education Committee has turned its mind to these matters. Indeed much of this report feels tired and wistful, not only for an era when overseeing universities was more straightforward but for days when this Committee was setting an agenda. Hence, perhaps, its unwieldy number of recommendations. It’s not likely that any will lead directly to action, but there’s a certain satisfaction to be derived simply from ticking all the boxes. Radicalism can arrive in unexpected forms. For months now one of the hottest topics on academic social media – and for good reason – has been the precarious employment conditions endured by many early career researchers. The Universities and Colleges Union even staged a strike ballot on the issue, albeit linked with other matters. But then along comes the consultation documents from the review of the Concordat to Support the Career Development of Researchers, to show us how it’s done. The Concordat was established in 2008 ‘to improve the employment and support for researchers and research careers in UK higher education’ by ‘setting out clear standards that research staff can expect from the institution that employs them, as well as their responsibilities as researchers’. The ten-year review process has to date produced a report by a Review Panel, a response from a Steering Group, and now opens this week to a period of public consultation. The consultation process promises to be very interesting indeed. There is much in the Review that is uncontroversial and arguably overdue, such as recommendations about equality and diversity, or concerning the language in which the Concordat is framed. There are also some issues on which the Review poses purposeful challenges, such as length of contracts, the value of bridging periods between contracts, and the potential to transition some individuals from fixed-term to open-ended contracts. But the action is likely to centre on two matters: support for researchers’ career development, and the definition of researchers. Careers for researchers or researchers for careers? The lives of early career researchers are characterized by fixed-term contracts, high levels of competition and stress, and job insecurity. Most, especially in the sciences, will not find permanent employment as academics. From the beginning, the Concordat has aimed to face this context by understanding and prioritizing the interests and career needs of this crucial category of highly-skilled, motivated, yet also vulnerable people. Since the Concordat was produced, it has become standard practice that researchers employed on research council contracts are entitled to ten days per year for professional development activities. This may include, for example, independent research or training, and may be focused either on academic or non-academic career progression. As the Review notes, this entitlement is neither well understood nor consistently applied. Many individuals are still not getting the support they need, to progress either in academic or other careers. The Review’s response takes two forms. Firstly, ‘there should be increased emphasis and support, by both funders and employers, for uptake of researchers’ 10 days training allowance’. That will hardly prove controversial. Secondly, ‘20% of a researcher’s time should be allowed for developing independent research and skills’. To be clear, that means 20 per cent in total (i.e. inclusive of the existing ten training days), and represents a four-fold increase on the existing provision. The key responses to this proposal will come from research councils. Universities and principal investigators will be mightily anxious about potentially lost project time, and this will doubtless feature in institutional responses. Charitable and industry funders will likely also have views. My bet is a compromise; however, if the councils fall into line and are prepared to absorb the cost of one day per week when researchers will not be advancing the projects on which they are employed, this could well become the new reality. Yet there still remains a question: if the model of ten days per year is not being applied effectively, why would forty-four days necessarily work any better? Perhaps some respondents might also suggest that a more sensible requirement would be for universities to provide more tangible support for career development. At my university, the careers counselling service for postdoctoral researchers can be booked up several months in advance. Those sessions require just one hour of a researcher’s time, but can transform the way they understand their skills and career options. In other words, will the problem of career development necessarily be fixed by more time? Quality may matter at least as much as quantity; it might be more sensible for universities to be required to provide more support, rather than simply freeing time for researchers. Moreover, it could be argued that prioritizing time privileges the model of postdoctoral researchers transitioning naturally to PIs. That will appeal to many people, but will not necessarily fix the problem since this will inevitably remain a minority experience. Who’s an early-career researcher anyway? The Review’s point here is that for a revised Concordat to focus only on postdocs employed on funded projects is to ignore a plethora of other people, many of whom at present enjoy weaker levels of institutional support. This is the ‘academic precariat’. According to the Review, ‘the definition of “researchers” used in the Concordat should be explicitly broadened to include staff not primarily hired as researchers, but who are research active’. That’s teaching-only staff, hourly-paid staff, even laboratory technicians. And all these people – researchers almost by a process of self-definition – should as a result be eligible for the support outlined in the Review’s other recommendations. This will feel to very many people, not least those employed on hourly-paid, teaching-only contracts, like a blow for workplace justice. But there will also be objections, not solely on financial grounds. This proposal might have the perverse, and potentially chaotic, effect of sucking many more people into the scope of the REF, on the grounds that a substantial amount of their time is devoted to research. Moreover, it undermines the well-intentioned, if not always well-received, efforts of many universities to create teaching-only career-paths, on which academics will be rewarded according to a set of standards that does not include research. Good luck to the people who have to navigate a path through the responses on this one! The opening of the consultation phase has been cannily timed, to coincide with a day when everyone’s favourite postdoc, Rahul, proved that researchers can do anything. But there’s perhaps an even bigger challenge ahead for those charged with making sense of the consultation responses. What they produce will shape the lives of researchers for the next ten years. 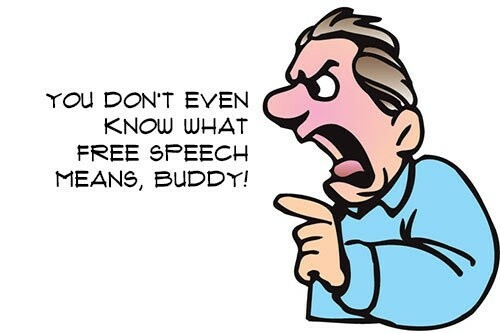 Free speech: whose problem is it really? At a time when the Universities Minister, Sam Gyimah, is renewing his free speech crusade – popping up at The Economist ‘Open Future Festival’ last weekend – there are indeed some glaring examples of problems. No-platforming, closing down of informed debate: it’s all there, just – well – not on university campuses in the United Kingdom. Take, for example, the treatment of the ‘Best for Britain’ campaign by the Conservative Party. Best for Britain is a peaceful and law-abiding group gaining widespread support in its campaign for a people’s vote on the Brexit deal, and had been planning to hold fringe events at the Conservative conference in Birmingham later this month. But applications by three group members for passes allowing them to enter the conference venue were last week refused. They were no-platformed. Or take a report of the response at the highest levels to one of the most careful academic studies so far on the question of the likely effect of Brexit on national food supplies. According to Tim Lang, professor of food policy at City University, his research group’s report did indeed attract the attention of the Secretary of State for Environment, Food and Rural Affairs, as one might well expect. But their meeting did not go well: “I told [Michael Gove] he was driving the country into a food security crisis. He looked incredulous.” And so, at a time when Professor Lang’s expertise is more valuable than at any other point in decades, I’m not getting the impression that he is being invited to present his analysis to other members of the government. And then there’s the case of Viktor Orban, prime minister of Hungary. He’s no proponent of free speech; indeed he has restricted the media and judiciary, and manipulated the democratic system to the advantage of his party. His repression has also been felt within universities: for instance, his government is proposing to ban gender studies courses, while the Central European University has declared it may have to leave the country entirely because Orban is refusing to legalise its status. Last week two-thirds of the members of the European Parliament supported a motion to censure Orban’s government. But where did Gyimah’s party – those proud defenders of free speech – stand on this matter? That’s right, they whipped their MEPs to vote against the motion. Maybe one could argue that there is not much wrong with any of this. The Tories surely have the right to decide who they want to hear at a conference, just as a government minister must by necessity sift competing voices on any issue. And maybe, after all, 95 per cent of the nation’s economists really are wrong, and their rational rebuttals of Patrick Minford and the Economists for Free Trade may justly be set aside. Maybe. Or maybe the ‘robust debate of contentious issues – to reach the truth’, something Gyimah sees as ‘core to university life’, is somewhat absent at present from political circles. And maybe one could also argue – perhaps with rather more cause – that student unions have the right to decide how debates will be staged on their premises. For the evidence that critics raise on this issue tends to reduce to a handful of well-publicized cases, usually centred on students’ unions rather than universities, that regardless collapse under any degree of scrutiny. Arguably, then, much of the fabricated outrage over alleged censorship on campus boils down to resentment that someone or other was not invited to speak somewhere or other. Surely students should not be left to make these decisions themselves, especially when the Conservative Party is evidently so much more reliable in its ethical judgements. A generous reading of Gyimah’s attack is that it’s merely a diversionary tactic. It doesn’t pay for Conservative universities ministers to look as though they are too close to universities, so it’s helpful in political terms to pick a fight or two. And a cultural matter like free speech plays well with the rightish edges of the party while making little practical difference to the way in which universities operate. It’s worth noting, in his defence, that Gyimah has not – yet – hit the revenues of universities; indeed on research spending there is a positive story to tell, while his recent endorsement of universities’ core mission was widely welcomed. But I’m no longer prepared to take that generous reading. I’m sick of the slipshod approach to evidence in these attacks on universities, and I’m tired of being told that students and academics have insufficient respect for divergent viewpoints – that we’re not much fussed with the truth. How about, just for once, setting aside the easy, damaging rhetoric and looking at the hard, complicated facts of speech on campus? In other words, how about setting an example of intellectual honesty for other members of this historically slippery, self-absorbed government? Moreover, whatever their motivations, Gyimah’s largely unfounded attacks on universities are working to deflect attention from far more serious problems at the heart of his own government. He is at present complicit in a project to close down debate and suppress uncomfortable evidence, and the nation stands to suffer as a result. He would therefore do well to direct his gaze to his own workplace, and turn his supposed passion for reason and transparency upon the debased way in which Brexit is being discussed. Universities are not the problem here. Higher education policy debates have become remarkably shouty. Perhaps people fear that unless they identify massive structural problems and propose sweeping reforms, all in a very loud voice, nobody will take any notice. Usually nobody takes any notice anyway. If you thought that the House of Lords might offer something altogether more elevated, you would be very much mistaken. 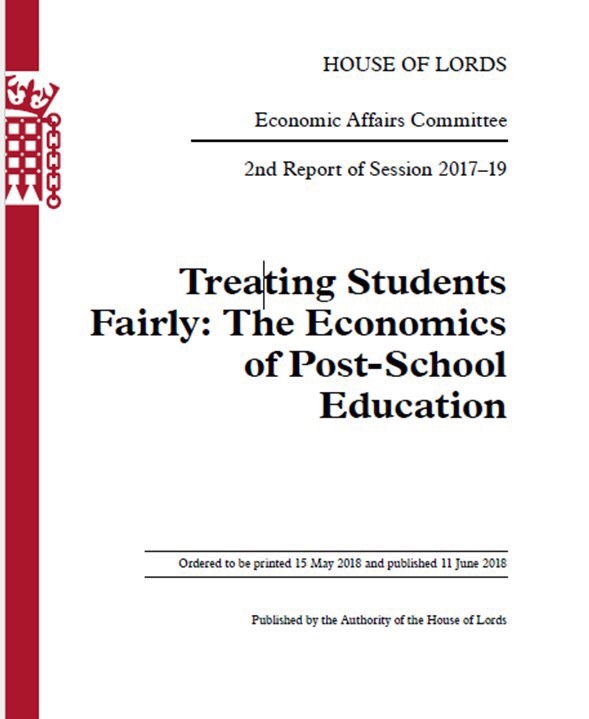 Its Economic Affairs Committee report, Treating Students Fairly: The Economics of Post-School Education, published last week, is very much a product of its time. The lords listened to some shouty people, saw nothing but trouble, and shouted a little themselves. Like so many commentators on higher education, these lords can’t quite work out what they want to shout about. The report’s most significant points are financial: the loans system, the effect of abolishing maintenance grants, the squeeze on further education, and misuses of the apprenticeship levy. These are hugely important matters, but all too often their arguments suffer from sketchy research and lack of depth. The paint scrapes away all too easily; for example, Nick Hillman took just a few days to pick apart one of the report’s key arguments about further education funding. We might equally examine the question of fees. This was a subject they could so easily have left alone; I mean, why enter this quagmire, when there were more urgent and original lines to pursue? In the space of a few paragraphs, they quote the unquestionable expert Andrew McGettigan, the splenetic Andrew Adonis, a parent who has just discovered the notion of ‘self-guided study’, and a student who happened to write in to say he reckoned fees should be somewhere around £3000. On the back of this research, and with not a thought to calculating the impact of real-terms funding cuts on the quality of British universities, the lords stick their fingers in the air and conclude that fees should remain frozen ‘for the medium-term’. My point is that they did not need to dive down the rabbit-hole marked ‘value-for-money’, nor listen to mad hatters in their own House. And their adoption of the methodology of talkback radio merely prompts the reader to question their evidence elsewhere. For instance, I’m broadly sympathetic to the argument that maintenance grants should be reintroduced; however, the report’s evidence for the impact of abolishing grants is almost exclusively anecdotal. It also rests rather too heavily on a desire for all graduates to emerge from university entirely equal, which is to ignore the desperate inequalities which the British economy otherwise nurtures (and, frankly, which their House represents). We might call this the ‘universities must fix everything’ delusion: it’s rather common. The report also betrays a whiff of disdain for universities and those who choose to spend their time at them. In a familiar manoeuvre, universities are simultaneously attacked for not creating a market in terms of pricing, and slated for daring to operate rationally in response to the government’s market-based reforms. How dare we set our fees at £9000? How dare we all want to be universities in the first place? Students, meanwhile, are manifestly being had. Why, the lords ask, ‘are people continuing to pursue undergraduate degrees if future employment benefits are uncertain?’ At heart these are serious debates; they are correct to point out that the link between graduate numbers and economic growth is no longer as solid as it once was. Nor are they alone in wanting to raise the profile and status of apprenticeships. Fair enough, but their decree that schools ‘must present all post-16 and post-18 options as equal’ occupies the realm of dictatorial fantasy, while the report’s tone is dismissive of those who dare to aspire to higher levels of education. Might they have given, perhaps, a moment’s thought to how it might look for a handful of the most privileged people in the country to dismiss some young people as ‘overeducated’? I have an inkling my own students would not take that too well. There’s not much respect for student achievement either. Grade inflation – another of the report’s unnecessary crusades – surely cannot be the result of students’ ability and labour, can it? On the basis of precisely no evidence whatsoever, they propose that this pattern ‘may’ be a result of universities being ‘incentivised … to attract prospective students’. It ‘may’; seriously, they’re worrying about grade inflation, yet they have the temerity to put this sort of unfounded speculation in an official report. And of the student voice? Well, the National Student Survey is clearly unreliable, because they heard an anecdote about a university that pays students £5 to complete it. The assumptions that this story is true (interestingly, they do not dare to name the university), and that students could so easily be bribed, are worthy of the Daily Mail. The fact that the subsequent paragraphs hopelessly confuse the NSS with the Teaching Excellence Framework rather confirms the damage to the report’s credibility. But there is perhaps even more disdain for the government. The Augar Review, the government’s ‘major’ effort to rethink student finance, is not even mentioned. Moreover, the extravagant, largely uncosted recommendations in Treating Students Fairly seem cruelly framed to make Augar’s team, hamstrung as they are by a requirement that no more money can be spent, appear niggardly. Nor do the lords have any time for sparkling new administrative structures. The Institute for Apprenticeships – barely a year old – ‘should be abolished’. The Office for Students ‘should’ have its ‘remit … extended to regulate and fund all higher education’. I mean, guys, I know the Office for Students doesn’t have a lot of friends, but maybe we could give it a few more weeks before pulling it all apart. By the end, the shouty tone and spirit of revolution leave the reader perplexed, struggling to make sense of some genuinely important recommendations against the background noise. There must be better ways of engaging with these debates, and also more effective ways of connecting with those running the show. At risk of being accused of grade-inflation, I’d give it a 55. Apologies: it’s taken me a couple of months to upload this, after it was first published on wonkhe.com. Truth be told, I couldn’t work out how to edit pictures on a new computer. Then I got distracted by grant applications and end of year stuff; you know how it is. 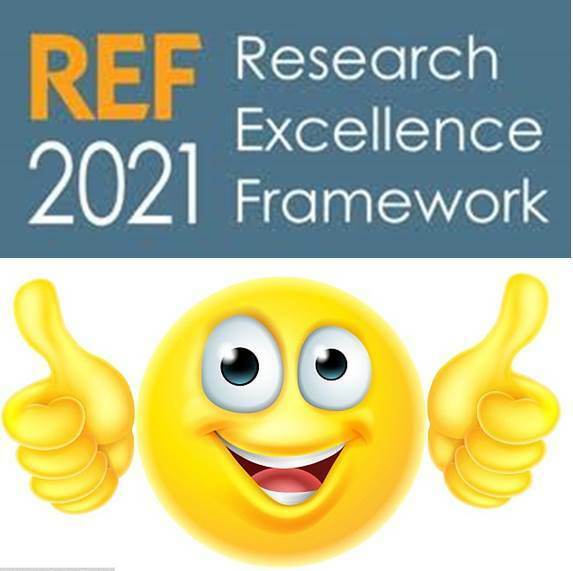 Imagine that academics across the United Kingdom were granted a referendum on membership of the Research Excellence Framework. How would they vote? This is a facetious question, since there’s never been anything democratic about the way the government distributes research funds. But if the mood of academics swings against the REF, there will always be politicians and bureaucrats prepared to suggest enticingly simpler systems. So a groundswell of opposition, whipped into life by a distaste for all forms of performance monitoring, should give cause for concern among remainers. A month ago, I would have predicted a strong vote for remain; after recent experiences with the leave movement on social media, I’m not so sure. It’s therefore worth considering what could be done to secure the vote. Regardless, a REF-less world would mean less autonomy for universities in decisions over research development, at a time when the government is already being more intrusive, most notably through the Industrial Strategy Challenge Fund. It would also be disastrous for humanities and social sciences disciplines, which do disproportionately well out of QR and disproportionately poorly out of grants. Toss in the possibility of variable fees by discipline, and HASS departments could face a generation in the freezer. Armageddon my point across? But maybe we need a more positive message as well. It’s striking just how many academics don’t see any benefits from QR. Some associate it merely with the few hundred pounds of research allowance that their departments hand them. Others resent central decisions to devote QR to grand projects that seem remote and unimportant. There are lessons to be learned here for VCs and PVCs. Granted, from their perspective all income falls into one big pot; researchers, however, want to feel the benefit of their labours. And it shouldn’t be difficult: for a start, how about universities transparently cost their research leave policies (for those that have them), and connect the dots with QR? And there may also be some lessons for UK Research and Innovation. RAEs and REF of the past have generated powerful, inspirational narratives of research success for the benefit of politicians and policy-makers. Might some of this effort be redirected towards researchers themselves, who more commonly experience the REF as an oppressive process than a source of inspiration? Perhaps their good will has been taken for granted. On the evidence of recent social media exchanges, some of the most vocal supporters of REF are immigrants. If the UK’s REF-shaped clarity of expectations has offered an international researcher a career-lifeline, to move from a country in which appointments and promotions are more sluggish and opaque, this can engender a warm glow of affection. By comparison, academics who have known nothing but the REF are less likely to appreciate what it has done for them – creating jobs, expediting promotions, and so forth – and more likely to view those distant pre-REF days with a sense of wonder. Back then, people spent longer on their big ideas, didn’t they? Britain produced big, serious books, and Nobel prize winners. Academics were left alone to just get on with it. 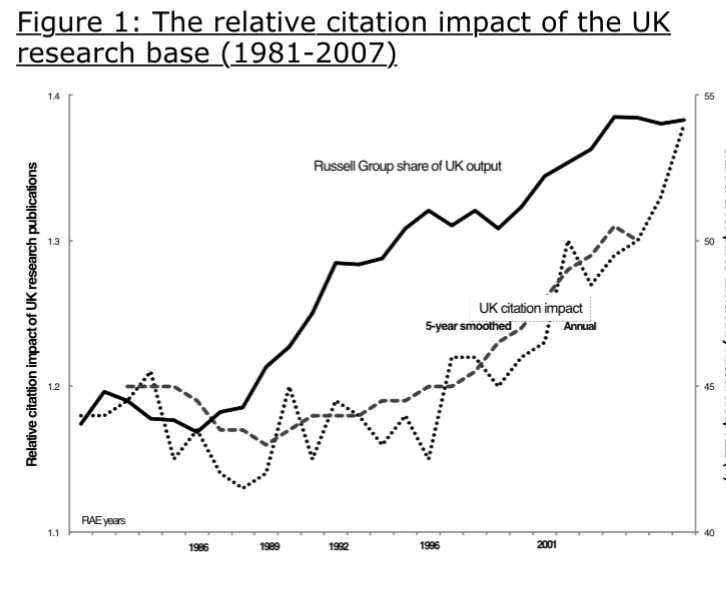 Too much detail in this table, but it demonstrates the rapid growth of UK research impact, by citation, in the RAE-era. From Adams & Gurney, Funding selectivity, concentration and excellence. One way of confronting this nostalgia is through data. There is evidence that British research in general was lagging through the 1980s. The surge that has brought the UK to its current position can be traced back to the effects of early RAEs beginning to bite within universities. The UK now UK ranks first amongst its comparator countries by field-weighted citation impact, and this can be explained in part by its broad research base. But data alone won’t convince people to love the REF. Leavers have the more compelling stories: of poor management in the name of REF preparation; of ECRs being suspended in casualization as they try to build sets of publications to sell to an employer that will immediately push them to repeat the performance for the next cycle. So there’s work to be done for the remain campaign. Pointing to Professor Ego who has just secured a big pre-REF pay-rise won’t necessarily seize the imagination of a lecturer losing money on the picket-line. UKRI might do well to take some initiative, aiming to make the REF less forbidding. A training programme for line-managers might help, or some research into the effects of REF on appointment decisions. REF might also align itself more explicitly with ethical frameworks such as Athena SWAN or the Vitae Concordat. The ‘real-time review’, announced this week, looks like it might be a step in the right direction. REF managers may feel burned by the reception of their well-meant proposals on portability, intended to iron out distorting effects of their system on the job market. But now that the rules for REF 2021 are settled there is space for further efforts to inform academic culture. Maybe love is unrealistic; trust, actually, would probably suffice. There are more important debates to be having than the one about REF. We should be focusing on the overall quantity of public research funding. Then we might consider the balance between grants and QR. And then again there’s the desperate uncertainty over European Union collaboration. Fussing about the mechanism for distributing QR feels insular, and risks giving the impression that academics are not much bothered with accountability. But perhaps the REF-erendum is a process we need to embrace all the same. The remain camp can win, yet they may need to engage more openly with their critics’ concerns. These won’t just disappear; and if the remainers lose, nobody can expect a second vote on the withdrawal terms. For academic researchers, there is one headline figure in the report Value for Money: the student perspective, published this week. Although this particular statistic is bound to be ignored in all mainstream media coverage of the report, it states that 70% of students either “definitely” or “mostly” agree that their tuition fees should support “academic research related to [their] subject”. Students, in other words, want their lecturers to succeed as researchers, and are prepared to underwrite these efforts. Only 18% disagree. We have learned over the past year how easy it can be to harvest grumpy quotes from disaffected students. We have also heard politicians and commentators endlessly rehearse assertions about the supposedly poor value for money of many degrees. Amid this morass of hyperbole and bile, Value for Money: the student perspective, produced by a consortium of students’ unions and based on a survey of over 5,000 students and 500 recent graduates, offers some precious shards of sense. As we might expect, the messages are not entirely rosy. On the overall question of whether students perceive that their courses represent good value for money, only 38% agreed, while 44% disagreed. These figures are consistent with the finding from last year’s Higher Education Policy Institute survey, imprinted into the minds of politicians and newspaper columnists, of 35% “value for money” satisfaction. So there is an issue here, and this has been endorsed by the Office for Students, which has a commitment to “value for money” written into its mandate. But maybe this report also includes some signals towards solutions. For a start, it helps us to unravel what students understand when they are asked about value for money. The picture here is far from clear. For instance, how might we account for the fact that only 70% of Scottish students feel they are getting value for money? The mainstream media has reported this as a high number; however, when we consider that Scottish tuition fees are precisely £0, one starts to wonder about the perceptions of the remaining 30%. Granted, it was a small sample, and some of them may have been paying English fees, but what more do they want? For a second example, consider the disparity in views between English and international students. The latter subsidise the former, yet they report significantly higher levels of satisfaction on the question of value for money. Furthermore, the figures suggest some instructive misconceptions about university finances. Take the statistic that 24% of students do not think that their fees should fund “university management costs”. One explanation for this figure is that there is a higher number of edu-anarchists among our student body than previously acknowledged. Another—perhaps more plausible—is that many students believe universities have other sources of funds that can cover all that stuff. Maybe such students assume that the state is funding universities rather more than is the case. This suggests, as the report’s authors also argue, that greater transparency about university finances may be beneficial on all sides. There will always be some students who divide £9,250 by their number of contact hours and dash off a stinking letter to The Telegraph. Indeed we now also know that 10% of students evidently do not want any library resources. (I mean who cares, really, about books and journals when all you’re after is a degree and a job?) But the majority of students are more than capable of thinking carefully—and critically—through questions of cross-subsidy and university management. This may even present a way forward on the thorny matter of vice-chancellors’ salaries. If we accept the Russell Group’s calculation, that its average vice-chancellor’s salary absorbs 0.05% of the respective university’s turnover, then each student is contributing roughly £4.63 to those salaries. For some, to be sure, that may be £4.62 too much; for the rest, one could reasonably hope that any VC could make a case for an impact on the student experience equivalent to the cost of a cup of coffee a term. There may also be lessons here for the Labour Party. That gap between satisfaction with value for money in Scotland and England is substantial, but is it really worth the cost attached to abolishing tuition fees south of the border? And is it worth the risk of under-funding, especially when this report provides such powerful evidence of the value students place on low staff-student ratios, high-quality learning resources, employability support, and so forth? As I read this report, the key lesson is one of communication, not financial revolution. At its best, the value for money debate may help to focus afresh on the nature and values of the university. As this report demonstrates, the discourse of value for money does not need to be as reductive and punitive as it has appeared in much recent criticism. Most students are unquestionably committed to the institutions in which they have chosen to invest their time and money, wanting them to succeed. A majority—58%—approve even of their fees being committed to “capital expenditure”. Indeed if I have one criticism of this survey, it is that students were not asked about the value to them of their university’s reputation or international standing. Responses on that score would have been fascinating. 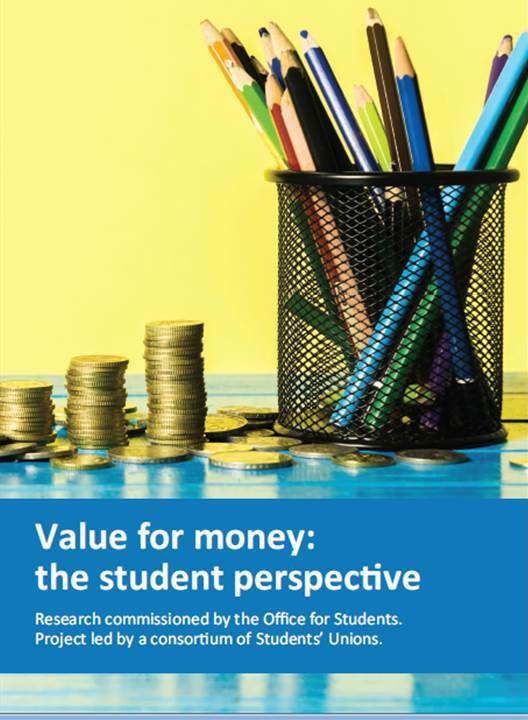 So Value for Money: the student perspective, for all of the challenges it presents, represents an important step towards more meaningful debate. Students want their universities to flourish, just as they want to support their lecturers as researchers. While many who work in universities worry about increased financial constraint on the horizon, an openness to dialogue with our most important stakeholders—our students—still holds the potential to take the sector forward. 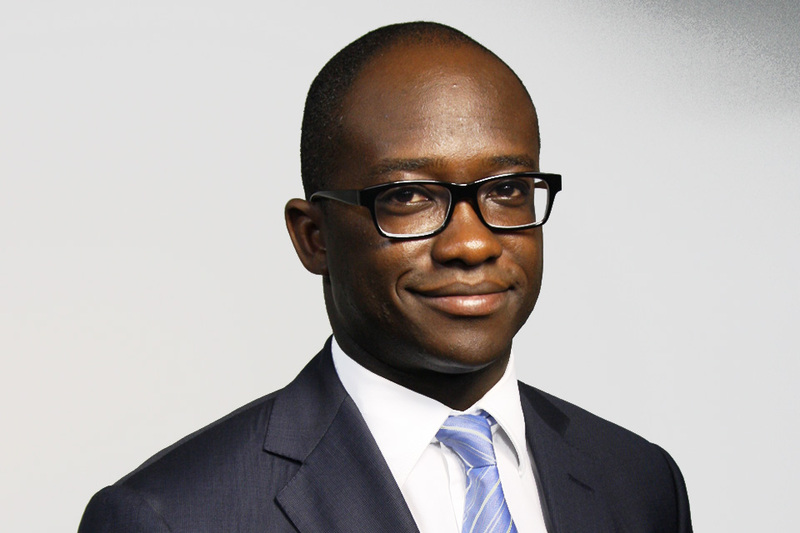 Sam Gyimah was never going to throw new light on the Office for Students when he spoke last week at its inauguration. It was never his project, and after its early stutters he probably just wanted to get through the day as uneventfully as possible. But his speech, ‘A Revolution in Accountability’, was enlightening nonetheless, for the evidence it provided of a minister coming to terms with his brief. Proclaiming Gyimah’s desire to be ‘a minister for students’ as well as minister for universities, it was in part personal, in part naive, and in part troubling. The speech’s greatest howler, the assertion ‘that universities need to act in loco parentis’, has been debunked elsewhere. To be generous, this suggests an admirably deep commitment to students’ welfare; to be critical, it positions the minister alongside so many other critics of universities, identifying a few problems and coming up with an answer that kind of feels right. Intentionally or not, indeed, this speech says rather a lot about the current state of higher education policy. Where did he get that idea? Yes, we could have told him all that, yet there is no harm in learning through engagement and dialogue. What is more worrying for me is that he appears to have little interest in other forms of learning. Many politicians will sprinkle speeches with quotes from social theorists, or references to key books and reports. Gyimah surely must have noticed, for instance, that one of his predecessors, David Willetts, has published rather a weighty volume on universities. But there’s not much indication in the speech that he has read anything beyond the ‘credible commentators’ he mentions, who have turned critical eyes upon universities in newspaper columns and social media over the past year. Quite how they become ‘credible’, in Gyimah’s eyes, is not clear: maybe by saying the same things over and over. His willingness to settle for the word of popular critics leads Gyimah to the only hard statistic in the speech. ‘The most recent HEPI survey,’ he tells us, ‘showed that 34% of students feel they are getting poor value from their courses.’ I wonder sometimes whether those at the Higher Education Policy Institute are embarrassed by the caricature their ‘Student Academic Experience Survey’ has become. (‘Ah yes,’ they’re told, ‘that’s the “value for money” survey.’) It also strikes me as odd that the minister should not bother to look beyond this figure. The profile of the National Student Survey – completed by roughly twenty times as many students as the HEPI survey – is maybe as low outside universities as it is high inside them. Might that be because it tells more nuanced stories? Maybe it would be unfair to expect a new universities’ minister to present his party’s policy as coherent. After all, nobody else has managed to do so. Nonetheless, this speech provides some eye-watering moments: such as the segue from a paragraph boasting how the Tories have ‘put universities on a sustainable financial footing’, to another that begins: ‘This year, we are doing more. We have frozen student fees.’ If that’s Gyimah’s idea of action, we might all settle down for a doze. In line with his ‘credible commentators’, Gyimah presents universities as resistant to the ‘winds of change’, but struggles to put his finger on precisely how. Is it ‘free speech’, perhaps. He doesn’t choose to elaborate. Is is ‘decolonizing the curriculum’? Well, he just tosses that one out there, as you do. Is it ‘top pay’, perhaps? In all, there’s a sense of someone ticking off a list of topical issues, with little sense of how he, as a minister, might approach them more meaningfully than someone who has just dashed out 1000 words for the Telegraph. For these winds of change have been fanned largely by the pages of newspapers. This is also a worryingly limited vision of higher education. When Gyimah speaks of ‘students’, he almost always means undergraduate students. Moreover, his statement that ‘the brightest and the best [students] from around the world are queuing up to study here’ will surprise many people. On the one hand, it echoes a line we’ve heard before from the Tories, that only the ‘brightest and best’ people from overseas really matter to us. On the other hand, it reeks of complacency at a time when his own government places unnecessary barriers in the way of international students. The speech also leaves one wondering whether, if Gyimah styles himself minister for students, who might be the minister for research. The speech does not ignore research; indeed it includes the assertion that we have seen ‘the largest increases to research spending for 40 years’. (I guess there’s evidence for that, but it will surprise many readers.) Moreover, Gyimah offers no comment on how research spending might benefit students, just as he avoids any reflection on the distinctive combination of research and education that shapes universities. Gyimah’s UK university system is also gloriously insular. We are, he boasts ‘a global superpower in HE’: as though we have our top universities trained on our enemies like Trident missiles. He dodges questions of international collaboration, which is perhaps the greatest single determinant of research quality. A ‘successful post-Brexit future’, for Gyimah, ‘depends on harnessing all the creativity, ingenuity and excellence in our universities’. Many academics might suggest that access to European research funding would help a little as well. Maybe this speech came too early for Gyimah. For those of us who might meet him on his national tour, however, it indicates some areas where he still has much to learn. It can only be hoped that he is willing now to listen to people within the sector, as well as those ‘credible commentators’ who have done so much to warp perceptions of higher education. The term ‘value for money’ is now deeply entrenched in public discourse about higher education in England. It is written into the Higher Education and Research Act. It is the subject of an ongoing enquiry by te House of Commons Education Committee, and it has launched a few dozen identikit newspaper columns. It is at the centre of what the Office for Students describes as a ‘major piece of research’ that it has recently commissioned, intending to probe students’ perceptions of value for money to ‘inform’ how the OfS ‘takes forward its legal responsibilities to promote’ it. And no doubt it will in turn inform the thinking of Sam Gyimah, the new minister for Higher Education and Science, as he implements the review of student finance and university funding announced last week. But one missing element in this debate is an agreed definition of value for money. When we talk about “value” in the context of university education, are we really thinking only about the material return of an undergraduate degree to an individual – as opposed to the wider impact of a vibrant university system? Whose “money” are we even talking about? And are we happy with individual perceptions, or are we looking for objective evidence? Given this lack of clarity, it’s worth pausing to consider where we are and how we got here. It’s also timely to reflect on the risks carried by these three little words. Nobody, least of all academics, wants universities that are not providing value. But if “value for money” continues to mean radically different things to different people, this peculiarly English debate is unlikely to lead to a better place. In a sector that is profoundly globalized, the value for money debate is surprisingly local. While other countries debate the funding of higher education in various ways, it is difficult to find anything comparable to our value for money terminology. And it is misleading even to call it a British issue; in truth it is confined almost exclusively to England. It can be traced back to the 2012 fee-increases, which have affected students in the four UK nations quite differently. The Telegraph made an early attempt to assess value for money in the wake of the £9000 fees, producing a table that rolled differences in living expenses into the overall costs of higher education. Given the relentless increases in the costs of university accommodation, this appeared to make sense; but it didn’t last. The Complete University Guide trialled a ‘value for money’ index, created by isolating the facilities and academic services spending of universities. This produced in 2015 a somewhat eccentric top five of: Buckinghamshire New University, Royal Agricultural University, University of Northampton, Durham University and the University of Hertfordshire. It duly sunk without trace. The Higher Education Policy Institute’s Student Academic Experience Survey, in operation since 2006, has achieved far greater impact. 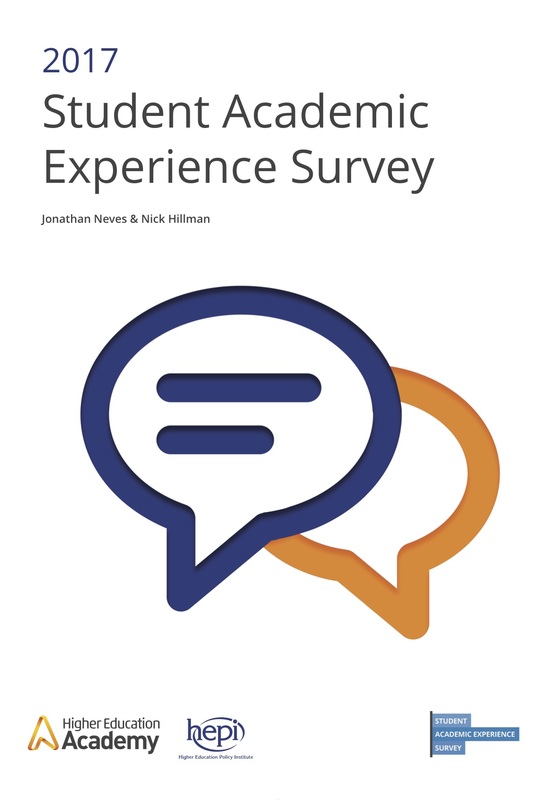 Just 14,000 undergraduate students, from all years of study, completed this survey in 2017 (less than 5% of the number who completed the National Student Survey). It has never enjoyed a fraction of the profile of the NSS within universities, in part because it has no impact on league tables, yet it has managed to achieve remarkable levels of attention within the media and with politicians. In its early years the survey attracted attention mainly for its valuable data on students’ work-patterns. Indeed very recent analysis has demonstrated its ongoing value in this respect, arguing on its basis for the importance of independent study, and pointing to the risks of two-year degrees. But it has blasted into the mainstream through its ‘value’ question. Specifically, in the 2017 version of the survey, Question 16 asked: ‘Thinking of all the things you’ve been asked about in this questionnaire so far, which statement best describes your view of the value for money of your present course?’ Hence the survey’s definition of ‘value for money’ is not so much explicit as implicit in those preceding questions. These cover matters such as contact time, assignments and feedback, the quality and qualifications of teaching staff and overall satisfaction. Interestingly, in 2017 Question 15, immediately preceding the ‘value for money’ question, asked: ‘Universities are now allowed to raise their fees in line with inflation to £9,250 if they meet certain teaching standards. Do you think this new fee should apply to [your university]?’ Given this trajectory of questioning – the sort of thing that may raise eyebrows in a court of law – it is perhaps not wholly surprising that the responses should have suggested a declining sense of value for money. 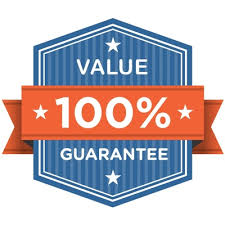 The headline finding, repeatedly rehearsed in the months since the results were announced, was that only 35% rated their degree as ‘good’ or ‘very good’ value for money. When students face the question this coming spring, the constant media attention to the issue over the past twelve months can surely only be weighting the scales still further. The other key factor that has shaped the debate on value for money has been the increased availability of graduate employment data. The Destination of Leavers from Higher Education survey has steadily risen in status over the past ten years or so, and feeds into most league tables. The release of graduate salary figures has also seized public attention. The concept of ‘low value’ degrees, now prevalent in popular commentary, tends to gesture loosely in the direction of such data. In actual fact, the data have tended to show that, while there are a handful of outliers – disciplines and institutions – at each end of the spectrum, the vast majority of graduates find that there are job opportunities and graduate premiums there to be seized. But rules of evidence are not strictly observed in this discourse. At a time of economic and wage constraint, cutting hard into the expectations of millenials, it is perhaps understandable that value should be rendered so consistently in financial terms. The cost of higher education weighs very hard on young shoulders. And in the context of the political and cultural instability of 2017, with one major party committing itself to slashing fees, it is equally predictable that students and their families should pause in their thinking on concerns value for money. Ye it remains striking – and disturbingly so – quite how weakly grounded in reality many of the popular complaints actually are. The Office for Students, established on 1 January this year, is charged (among other things) with ‘promoting value for money in the provision of higher education’. So the concept of value for money has slid effortlessly from the realm of a small-scale survey into the English higher education regulatory structure. One might expect we would therefore have a degree of agreement over what ‘value for money’ means – but evidently not. A remarkable amount of commentary, especially from the level of government, in fact begins with data from the Student Academic Experience Survey, as though its implicit definition of value for money was self-evident all along. Discussion has also been swayed over the past year by evidence that many students now leave university with over £50,000 of debt. While the figure was not far short of this amount previously, and while a student’s overall debt makes no difference at all to his or her monthly repayments, £50,000 was a sum that seized imaginations. This miasma of anxiety led to reports such as The Higher Education Market, produced by the National Audit Office, which fretted over the lack of variation in fees and made some headline-grabbing comparisons with the regulation of financial services. While such concerns seemed like old news to many people within the sector, the attempt to apply the logic and methods of the market to higher education was significant in itself. Like the Office for Students itself, with its focus on the interests of students as consumers, this report positioned higher education as almost entirely transactional in character. The ongoing enquiry into value for money established by the Education Committee stretches matters further. Taking its cue, as one might by this point expect, from the Student Academic Experience Survey, it is considering: graduate outcomes and the use of destination data; social justice in higher education and support for disadvantaged students; senior management pay in universities; quality and effectiveness of teaching; and (through a curiously circular rationale) the role of the Office for Students. Quite how some of these matters relate to value for money may escape sceptical observers. Perhaps the key lesson is how this discourse, once given credibility and licence, can become an umbrella under which all manner of concerns might be sheltered. The Office for Students consultation exercise, launched last autumn, suggested an intriguing new direction in the debate. Value for money is not just a matter for students, the Office suggested, but also ‘for taxpayers’. This line had been rehearsed by Jo Johnson, former Minister for Universities and Science, in a speech in the summer, and essentially follows the money-trail, since roughly 35% of the cost of the average undergraduate’s education is likely to fall into the lap of the state. Yet it perhaps leaves the door ajar to a more comprehensive appreciation of the value of universities within a nation. As Johnson himself stated, universities today are not merely suppliers of degrees; they are expected ‘to help drive national prosperity and advance individuals’ life chances’. This is the argument of the universities themselves. Universities UK routinely produces statistics demonstrating the net national benefits produced by expenditure on higher education. It’s an investment, they argue, not a cost. The university sector, in the most recent calculations, contributed £21.5 billion to GDP, representing 1.2% of the UK’s Gross Domestic Product. International students are worth £7.3 billion to the economy, and so forth. Other countries take this sort of thing for granted in any consideration of the value of higher education. Australians, for instance, routinely speak with pride about higher education as a leading export industry, and consider the UK’s indifference to international students with open-mouthed incredulity. It is possible that Burnett’s arguments will gain traction, and that popular discourse around higher education will return to historically more familiar territory. But this remains a challenge. In the midst of a media-storm about student-debt, it is demonstrably easier to place alarmist stories about the salaries of vice-chancellors than to present evidence about the value, to students and their nation alike, of a well managed and highly regarded university. And it is very tempting, for commentators and legislators alike, when considering value for money, to separate the education functions of a university from all else. It can be argued that higher education has enjoyed a relatively easy ride through the era of austerity. While other sectors – health, schools, local government – have suffered severe cuts, the fee arrangement of 2012 was higher education’s ‘get out of jail free’ card. Arguments have also been won, with successive ministers and chancellors of the exchequer, over the value of research funding. These victories have brought a measure of stability, though also bred resentment, fairly or unfairly, within wider society. In precarious times, the discourse of value for money poses some undeniable risks. One element of risk is now written into the structures under which higher education is managed. In 2016 higher education was effectively split between two government departments: the education functions shifted into the Department of Education, and research left behind in the Department of Business, Energy and Industrial Strategy. Moreover, the Office for Students is more narrowly focused than its predecessor, the Higher Education Funding Council for England. It has some oversight – rather vaguely defined – of the nation’s ‘research base’, but otherwise research falls to the new UK Research and Innovation, and its subsidiary Research England. Hence when the Office for Students focuses on value for money, it is not easy for it to encompass the overall functions of universities, including research. These matter hugely in terms of institutional reputations, which in turn matter hugely in terms of attracting international students. By contrast, the isolation of the education-function invites reductive appreciations of universities. It leads people to ask why universities can’t deliver their products more cheaply, and even more swiftly. Far from representing a smart national investment, then, MPs can now be heard asserting that universities are ‘ripping off’ their consumers. Once the value of higher education is equated with the cheap delivery of skills, such arguments are no more than logical. In these forms, the value for money debate could have wildly unpredictable effects on the unfolding structural change within higher education. Commentators tend to overlook the intensity of competition within the system. In recent years some universities have expanded rapidly, while others have struggled, year by year, to meet their target numbers. Research funding is also being concentrated relentlessly into the hands of a minority of institutions. In this context it becomes easy enough to see how a discourse of value for money could be used to drive through sweeping reforms, such as differential fees, the formal downgrading of research at some universities, and even institutional closures. The Oxford English Dictionary defines “value for money” in terms of “reasonableness of cost of something in view of its perceived quality”. It isolates the relationship between a buyer and seller, focused on the quality of a commodity. But degrees are a peculiar kind of commodity. Students studying for one are years away from reaping the likely economic and social rewards, and their success is dependent as much on their own commitment as that of their lecturers. It is therefore an open question how they can possibly be expected to make an informed judgement on the value for money of those degrees. Yet such judgments now hold the potential to redraw the landscape of English higher education. The major review of funding, apparently resisted by Johnson and his sacked former boss, Justine Greening, looms large in 2018. It is being cheered on by influential Tories asserting, against conventional logic, that it will at once make fees “lower” and universities “better”. A secure government might assert greater, more mature influence in such an environment. Yet, at a time when universities are being sucked relentlessly into more profound debates about the kind of country England’s citizens want, this seems unlikely. This piece was first published (in slightly different form, with nicer picture but without the hyperlinks) in Times Higher Education.